Behold, brothers and sisters! I bring you good tidings of great joy … and comfort! Seersucker season is back, at least for those of us who live south of the Sweet Tea Line! Seersucker is, of course, the most wonderful fabric in the history of clothes, and the perfect thing to wear on summer days in the hot and humid south. But for many of us well-dressed southerners, seersucker season does not start with the arrival of the summer solstice. It arrives on Easter morning, just in time for one of the best-dressed occasions in the liturgical year, the Easter Sunday morning worship service. School No. 1: Easter Sunday morning to Labor Day evening. School No. 2: Memorial Day morning to Labor Day evening. School No. 3: Whenever weather permits. Andrew Thomas lives and writes in what is arguably, next to New Orleans, the greatest seersucker city in the world, Charleston. His blog, “The Pursuit of Civility,” celebrates the importance of courtesy, kindness, manners, and not coincidentally, seersucker! Thomas contends that which school of thought you follow for seersucker season depends upon your latitude and your attitude. The first school is found in the deepsouth below what Thomas calls the “Sweet Tea Line,” which should not be confused with the Mason-Dixon Line. The Sweet Tea Line is the demarcation point that truly separates the north from the south. If you go into a restaurant or diner north of this line and order tea, the waitress or waiter will ask you two questions: hot or cold? Sweetened or unsweetened? But if you order tea south of the Sweet Tea Line, you will be served iced tea already sweetened with sugar, no questions asked. And if you’re being served by a waitress, she may just called you “Darlin’,” which makes the sweet tea all the sweeter. Like Andrew Thomas, I’m a devoted follower of the first school of seersucker season thought. 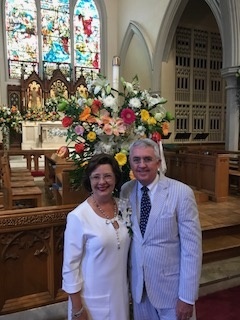 So last Sunday morning, I put on my best seersucker suit, silk tie, and white bucks, and headed to celebrate the Resurrection at Calvary Episcopal Church in downtown Memphis. I will continue to wear seersucker between now and the Annual Seersucker Flash Mob that will be held in the lobby of the Peabody Hotel on September 1st to signify the end of the 2017 seersucker season. There may be a few chilly days this spring, but that will not keep me from donning the light puckered cotton classic. As Ecclesiastes 3 teaches us, to everything there is a season, and a time for every seersucker purpose under Heaven! Target Ehr: Can nicely write on similar topics! Welcome to here you'll find out how it should look. poker online: Thank you because you have been willing to share information with us. we will always appreciate all you have done here because I know you are very concerned with our. 안전놀이터: Thanks for taking the time to discuss this, I feel strongly about it and love learning more on this topic. If possible, as you gain expertise, would you mind updating your blog with more information? It is extremely helpful for me. Warmtepomp: It is very good, but look at the information at this address. Zonnepanelen: Zonnepanelen kopen? In 2019 de populairste manier om duurzame energie te produceren. Zonnepanelen installateur Soloya plaatst uw Tier 1 zonnepanelen. Amrit: Allahabad Board 12th result 2019 : Uttar Pradesh Madhyamik Shiksha Parishad i.e UPMSP conducts Intermediate Exams for students of Class 12 every year. UPMSP is the largest examination board in our country.